﻿﻿20 pages of information and photos plus a series of earthbag and mud building emails. FREE! Yes, I'd like that Earthbag PDF! If you are building any kind of natural home (strawbale, cob, earthbag) you are not going to want a standard concrete foundation. Portland cement foundations have been around for less than a hundred years. Buildings have been built for millennia. In the eastern Mediterranean it's common to see structures still standing over 2000 years after they were built, without a drop of Portland cement. 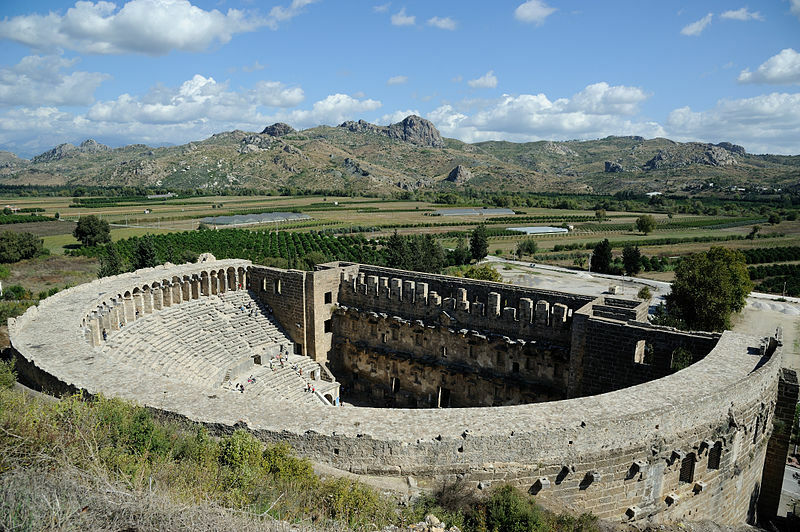 Aspendos amphitheatre in southern Turkey. Still going strong after 2500 years. Using the ubiquitous concrete footings is not just about being ecological (the carbon footprint for producing the stuff is massive). People often have the (wrong) idea that the only point of your foundation is strength. In fact, many factors contribute to the structural strength of a building. The foundations are only one piece of the puzzle. Much more important in a natural build is drainage. Whether you are using mud, wood or straw, you want to be ridding your footings of water as fast as possible, and Portland cement functions badly in this respect. It has a habit of wicking up water, and holding the damp. 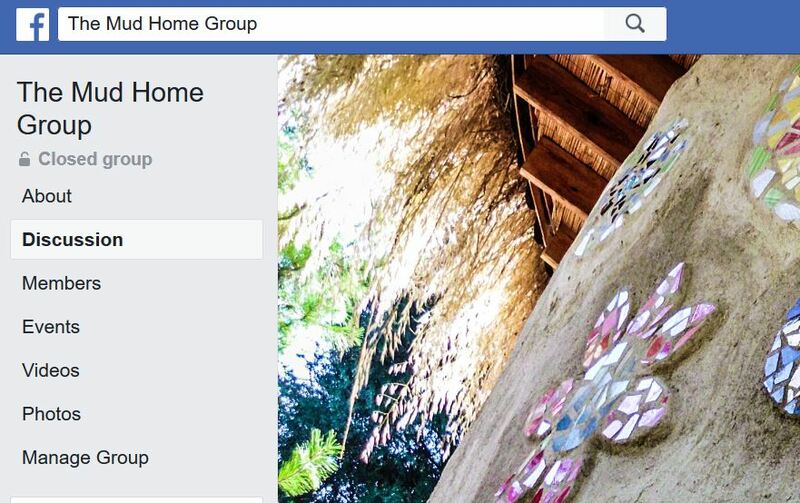 This is the worst news ever for a natural home, which can then suffer mold. What to use instead? The simplest, most brilliant (in my opinion), cheapest and most effective foundation is the rubble trench. 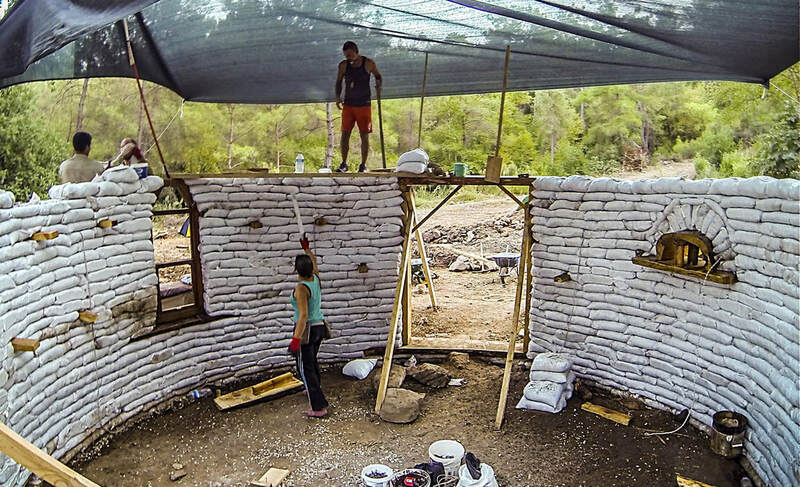 I used arubble trench foundation for my earthbag house in Turkey. And I can say hand on heart, if you live in an area that experiences a lot of rainfall nothing beats it. For the doubters, my house has withstood 5 large earthquakes, and is bone dry. Gautam Singh and Kim in Mumbai used the same method exactly, and it stood a monsoon with the same results. 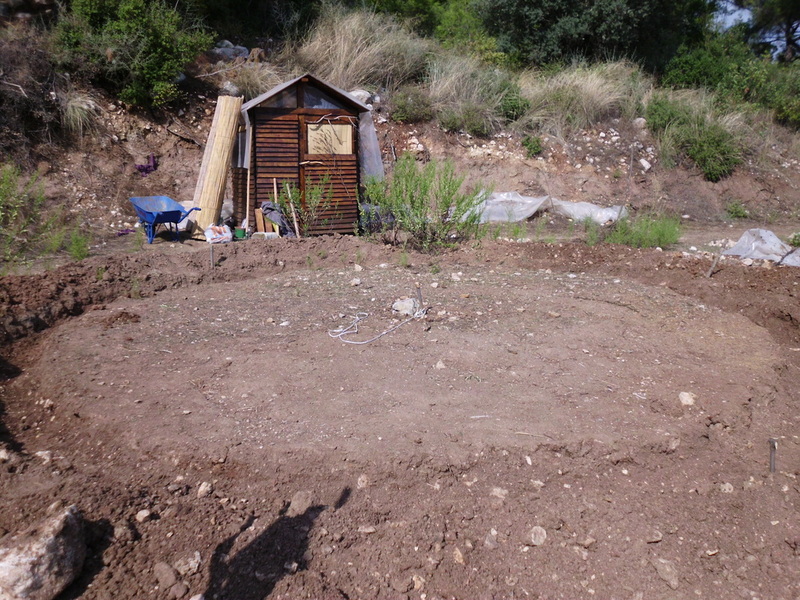 The beginning of the trench, dug by Celal and yours truly. (See bottom of post for rubble trench foundations for other natural home types). 1. Dig a trench half a metre deep. Make sure the trench is wider than the earthbags. It is better if you line it with a geotextile membrane, as this prevents the earth from seeping into the rubble over time. I didn't do this, as you can see, and there was no issue after 5 years. 2. 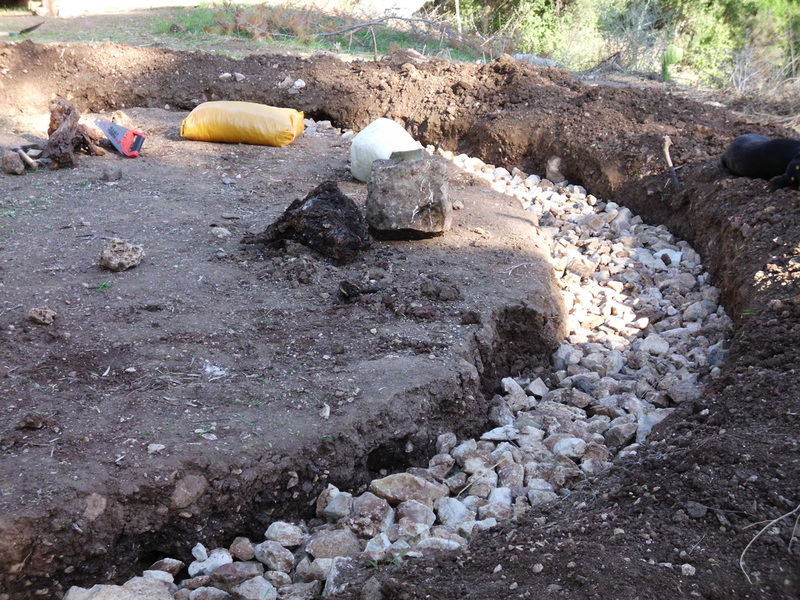 Fill the trench with rocks from the surrounding area up to about 20 cm below grade. You can slot a French drain in here too if you like. A French drain is basically a pipe with holes in it that runs at the bottom of your trench. 3. Cover your rocks with smaller round-edged gravel (this prevents polypropylene bags from ripping). 4. Lay two or three layers of gravel-filled polypropylene bags with thick barbed-wire between the layers for tensile strength. Double-bag your foundation layers to reinforce the sacks. 5. Fill in the gaps on either side of the bags with more gravel/rubble. This prevents water wicking up into your earthbag house. 6. Make sure you tamp the bags after each circle is laid. The gravel becomes nice and compact. 7. Protect your PP bags from sunlight (especially the foundation layers) until you put on mud plaster. UV can break down the bags. Fill your trench with rubble to act as a sieve for drainage. 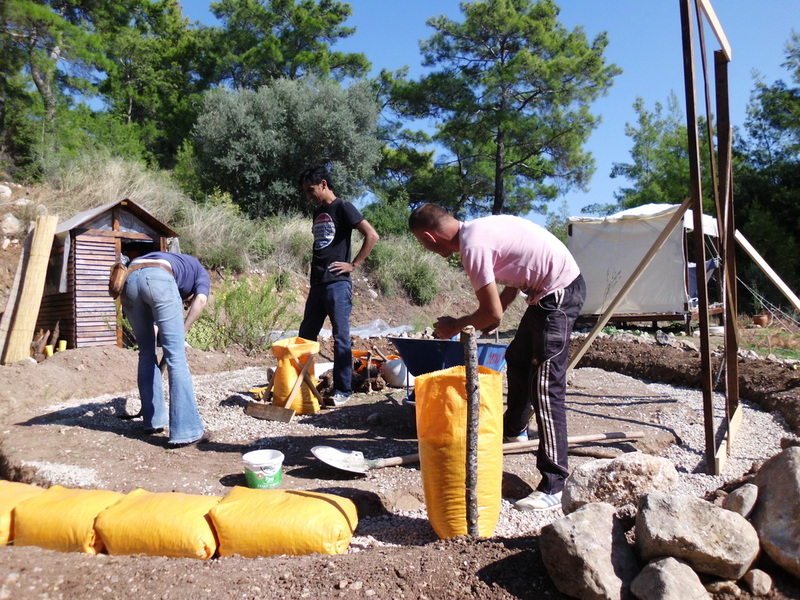 Annika, Adnan and Ahmet on the first layer of gravel bags. What about if you're building with cob? Or strawbale? Want to take natural building further?